After blowing its late lead, Shawnee Mission West rallied in the final seconds and then held off Lawrence Free State Firebirds 41-40. The game was up for grabs up to the fourth quarter before the Vikings seized the victory in the deciding moments. “A lot of kids showed a lot of heart tonight,” West coach, Tim Callaghan said. One of those kids was quarterback Zach Witters. Witters was on the money all night dropping dimes to receivers, Jason Potter, Reggie Edwards and Isreal Watson in addition to making defenses pay with his legs on his way to score the go-ahead game-winning touchdown. Witters finished the night with 500 total yards and five touchdowns, the biggest being, the game-winner. “We showed that we (as an offense) could step up and make a play,” Witters said. Free State, on the other hand, committed too many turnovers in the second half to win. Two missed field goals and three turnovers doomed the Firebirds despite a valiant four quarter rally. The Firebirds found themselves in the game late thanks to huge performances by tailbacks, Zion Bowlin (rushed for 131 yards on 12 carries) and Jax Dineen (rushed for 48 yards on nine carries) along with receiver Zack Sanders (caught 242 yards on 13 catches). Despite the loss, Lisher thought both teams fought hard and said his team struggled with penalties and missed tackles in the loss. "There was a lot of adversity given by both sides and both teams responded,” Lisher said. “It was a battle of two heavy weights. Shawnee Mission West also struggled with turnovers fumbling the ball away in their own territory late in fourth. Free State took full advantage as quarterback Dallas Crittendon found Zach Sanders on a 49-yard touchdown strike to put the Firebirds up 40-33 after the extra point with less than a minute to go. The Vikings didn’t sweat it as they marched down the field seamlessly through a few quick air strikes and a 24-yard scamper by Witters. West had one last opportunity with 47 seconds to go, 14 yards from the end zone and Witters delivered. “We ran a boot leg continue so everybody was rolling right and the running back was rolling left and he was wide open so I just threw it up and he made a play,” said Witters. 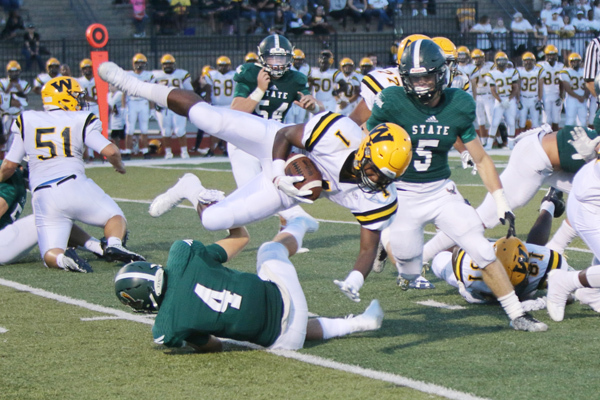 Witters and the Vikings are looking to continue to make those types of plays moving forward as they play another competitive road test at Leavenworth next Friday while Free State travels to Shawnee Mission South.